Contact between humans and other animals – human-animal interaction (HAI) – involves the mutual and dynamic exchanges between people and animals and their psychophysiological impact on individuals (Griffin et al. 2011). Though originally focusing on cardiovascular benefits of companion animals, researchers from a host of scientific fields – ranging from clinical and experimental psychology to public health and veterinary medicine – have demonstrated a wide range of positive effects of HAI on human health and well-being. 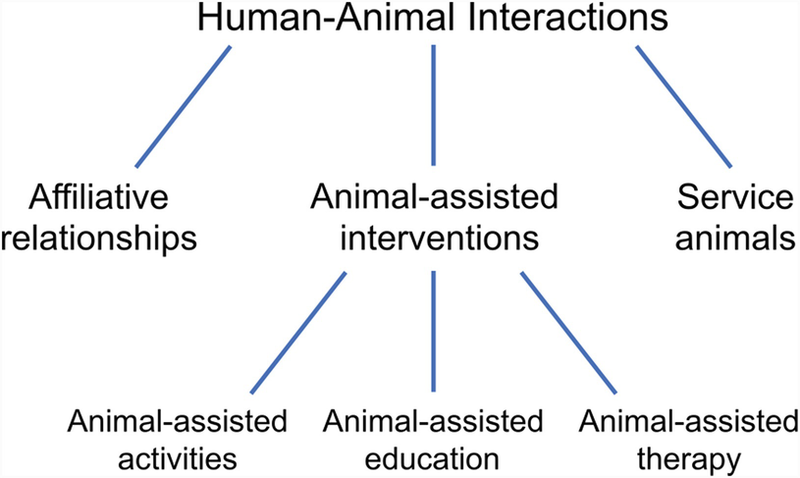 A taxonomy of HAI categorizes it into the affiliative relationships between humans and animals, animal-assisted interventions, and use of service animals for clinical populations (Fig. 1). The ever-present reciprocal relationships between humans and animals in societies throughout history translate today into both traditional social interactions as well as those catered to the evolving needs of the present day. In ancestral times, humans shared affiliative bonds with animals through cooperative hunting and companionship. Today, we have integrated animals into human society in novel ways, including bringing them into classrooms and therapy rooms. Although the bulk of HAIs involve dogs, these interactions can involve many other species as well. A number of clinical therapies incorporate horses into treatment plans, for example, and interventions catering to elderly populations employ small birds and fish (Beetz et al. 2012). The nature of HAIs, including the goals and degree of structure and training involved, leads to three classifications: affiliative relationships, animal-assisted interventions, and service animal interactions (Fig. 1). Affiliative relationships between humans and their companion animals, or Pets, entail a strong emotional attachment that facilitates the exchange of physical and psychological benefits. Pet ownership correlates with a number of health benefits, such as increased physical activity and lower baseline blood pressure (McCune et al. 2014). Because ownership is a choice, however, it is difficult to establish whether affiliative relationships cause health benefits or people likely to benefit choose to own pets. Animal-assisted interventions (AAI) involve trained practitioners (e.g., handlers, researchers, teachers, therapists) bringing animals into an environment to interact with people for the purpose of providing psychophysiological benefits. AAIs cover a wide range of interactions, from improving students’ reading ability in classrooms to helping stroke victims recover social and functional abilities. As such, the American Veterinary Medical Foundation (AVMA) partitions interventions into animal-assisted activities, education, and therapy (AVMA 2019). Structured and goal-oriented interventions aiming to improve educational outcomes are referred to as animal-assisted education (AAE; AVMA 2019). AAEs in primary schools incorporate dogs and small animals (e.g., guinea pigs, rabbits) in programs tailored to typically developing students as well as those with special needs. Reading programs are the most common, empirically supported interventions for typically developing students (Brelsford et al. 2017), but classrooms also house animals to promote students’ general concentration, motivation, and relaxation (Beetz et al. 2012). Interventions for students with emotional or behavioral needs use dogs for the same purposes, as well as to improve social and emotional outcomes in the classroom (Brelsford et al. 2017). Animal-assisted therapy (AAT) requires specific goals for enhancing an individual’s cognitive, emotional, physical, or social functions (AVMA 2019). AATs are structured, short-term interactions delivered in therapeutic contexts by professionals in the field. Animals have been used in therapies for children with autism, adults with spinal cord dysfunction, older adults with dementia, and prison inmates (Beetz et al. 2012; Muñoz Lasa et al. 2015). Unlike animal-assisted education and therapy, animal-assisted activities (AAAs) are not exclusive to structured and goal-oriented programs, leading to rich variety in these interactions. AAAs enhance individuals’ quality of life and center the animal as a motivational or social tool in an interaction with the aid of a trained volunteer, paraprofessional, or professional (AVMA 2019). For example, AAAs include having animals interact with college students in de-stressing events (Crossman and Kazdin 2015), elderly populations in geriatric facilities (Souter and Miller 2007), and children during doctor’s visits (Beetz et al. 2012). Service animals are individually trained to help disabled persons overcome specific disabilities. They promote a more independent livelihood, facilitating, for example, mobility for the visually impaired, low blood sugar detection for diabetics, or support for veterans with post-traumatic stress disorder (PTSD; McCune et al. 2014; Rodriguez et al. 2018a). In the United States, the Americans with Disabilities Act and other federal legislation regulates service animals as those explicitly trained to perform tasks for individuals with disabilities. Animals that also live with individuals and are prescribed by medical professionals to improve health and well-being, such as emotional support animals and comfort animals, are not recognized as service animals because they have not been trained to perform explicit tasks. The Americans with Disabilities Act limits service animals to Service Dogs and small horses (AVMA 2019). The variety of possible types of interactions that occur between humans and animals results in an equally rich variety of effects on human health and well-being, including behavioral, educational, physiological, and/or psychological effects. HAIs seem to strongly influence social behavior, perhaps due to the social nature of the interactions. All HAI types promote social interaction. Affiliative interactions resulting from child pet ownership, for example, promote positive social interactions, autonomy, and responsibility and decrease aggression (Purewal et al. 2017). The explicit goal of many AAIs is to facilitate social interactions, such as therapies for autism spectrum disorders, dementia, or intellectual disability (Muñoz Lasa et al. 2015). Service animals facilitate social interactions as well, demonstrated by disabled persons experiencing more positive social interactions when their service dog is present than without (Beetz et al. 2012). HAIs, most commonly AAIs, provide motivational, social, and emotional benefits to students across all levels of education. Primary education classrooms use dogs to promote a range of behaviors to improve their experience and performance (e.g., concentration, motivation, relaxation) in classrooms generally as well as through reading and behavioral programs (Brelsford et al. 2017). AAIs on college campuses, on the other hand, cater explicitly to relieving exam-related stress (Crossman and Kazdin 2015). These stress-relief sessions, where students interact with animals for short periods of time at their will, occur outside classrooms on campuses to reach a large number of students. The physiological effects of HAIs relate to stress, bonding, and physical activity. The physiological benefits of HAI can be direct, such as decreased blood pressure, or indirect, such as with increased levels of the hormone oxytocin in bonding. Long-term affiliative interactions can influence cardiovascular measures associated with physical health (e.g., blood pressure, heart rate, heart rate variability). In individuals with cardiovascular disease, for example, pet owners have lower mortality than nonowners (Schreiner 2016). In healthy populations, pet ownership correlates with lower heart rate, lower blood pressure, and faster stress recovery (Schreiner 2016). AAIs also elicit cardiovascular effects, where the intervention mediates cardiovascular responses to short-term stressors. These shorter-term interventions aim to reduce stress in doctor’s offices, before dental procedures, and in laboratory settings (Beetz et al. 2012). HAI influences skin conductivity, or electrodermal activity (EDA), a measure associated with emotional arousal (Rodriguez et al. 2018b). Fiocco and Hunse (2017) introduced a dog following a stressful event, for example, and individuals with the AAI showed lower electrodermal activity than those without, suggesting the intervention reduced their stress response. HAI also affects cortisol, a hormone shown to increase in response to short-term stress, such as cognitive challenges, and long-term stress, such as depression (Schreiner 2016). Studies with both pets and AAIs show decreased levels of cortisol in the saliva following brief interactions, whether under stressful or normal conditions (Beetz et al. 2012). Service animals also affect cortisol levels, such as in veterans with PTSD who have service dogs (Rodriguez et al. 2018a). HAI influences other hormones related to social behavior. Oxytocin, a hormone and neurotransmitter that promotes social bonding, responds to interactions in both humans and the animals involved. When pet owners physically contact or look into the eyes of their dogs, oxytocin levels in their blood/urine increase in both owner and dog, an effect observed in AAIs between humans and unfamiliar dogs (Beetz 2017). Physical activity is a critical component of human health linked to decreased cardiovascular disease, diabetes, and other illnesses. Dog owners are more likely to meet national guidelines for physical activity (McCune et al. 2014). The physical activity that dog ownership requires (e.g., dog walking) is mutually beneficial, ensuring active lifestyles for both the owner and the animal. There are also animal-assisted interventions that facilitate physical activity, namely, for disabled individuals. For example, there are AATs for those with nervous system impairments to improve balance, limb-control, and walking (Muñoz Lasa et al. 2015). Human-animal interactions of all types elicit positive psychological effects in clinical and nonclinical populations across the lifespan. Pet owners are less lonely, depressed, and anxious, though the risk of extreme grief due to pet loss should not be overlooked (Schreiner 2016). AAIs can not only improve general mood (Beetz et al. 2012), but they can reduce symptoms of emotional disorders such as depression (Souter and Miller 2007) and anxiety (Beetz et al. 2012) and behavioral disorders such as attention deficit-hyperactivity disorder and autism spectrum disorders (Busch et al. 2016; Muñoz Lasa et al. 2015). Medical professionals prescribe individuals emotional support animals to mitigate these symptoms as well. Humans have interacted with animals for millennia, and these interactions are becoming more common in our daily lives. Because of the rise in the frequency of these interactions, a broad research effort exists to investigate how these interactions improve human and animal health and well-being. More collaborative scientific research is vital to grow and establish a theoretical understanding of the reciprocal relationship between humans and animals observed across the lifespan.